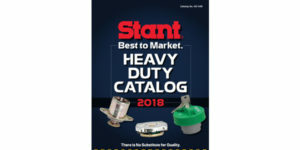 The new Stant Heavy Duty Catalog offers customers a complete line of products for the heavy-duty, diesel, agriculture, small engine, marine and aerospace markets. The Stant Heavy Duty Catalog features thermostats, fuel caps and radiator and oil caps for a wide variety of applications such as light-duty and heavy-duty on-road diesel engines and trucks, off-highway heavy duty equipment, diesel engines for all horsepower ranges, construction equipment and agricultural engines and equipment. To view the new catalog, visit Stant.com or contact your Stant representative to request a printed copy.